Get started with your business’ digital marketing with one of our under-$100 services below. Note: these services (and many more) are all included as part of full digital marketing packages. But, some businesses prefer to start smaller and so we offer these individual services separately, too. Every business is different and at a different stage of development, so we offer a variety so that we can provide each business with what will best suit their needs. Go here to see our Full Digital Marketing Packages and everything they include. Social profiles have many benefits, including exposure to your customers as well as many SEO benefits for the ranking of your website in Google. We will set up a Google-optimized social profile for your business to maximize its effectiveness. We do Facebook, Twitter, Yelp, Pinterest, Instagram, etc. We can do hundreds, but if you’re just starting out we recommend to go with the more well-known ones like we just listed. $19 each. 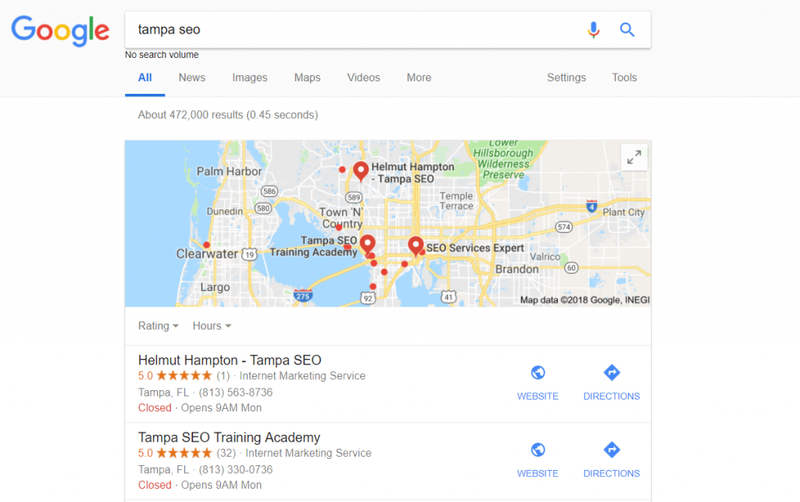 When you search for something in Google and you see the Maps listings (like in the picture), those are called “Google My Business” properties. Google My Business is essential for any business that wants to be found locally. You can’t rank in the Maps without it because that is what actually shows up in the maps, not your website. These properties need to be set up with Google and managed from within their dashboard. We provide this service as part of our full digital marketing packages. But, since it’s so important we offer it as a separate service to help you get started. We will set up a search-optimized Google My Business property for your business so your customers can find YOU when they search. This is similar to Google My Business but for Bing.